Having a root canal treatment with Dr. Angie results in the removal of damage without the typical fear and anxiety associated with this procedure. Our office is equipped with the tools and techniques that allow our patients to feel comfortable and confident that they are in good hands. 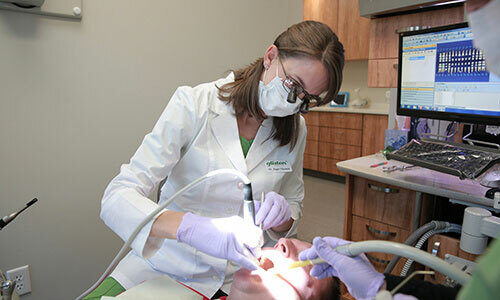 Dr. Angie administers ample local anesthetic to numb the area before beginning treatment, and uses an electric drill that is very gentle in the removal of decay. Many of our patients comment that this procedure is even easier than having a filling placed! Understanding why root canal therapy is needed, and even knowing what to expect from the process, may not be enough to eliminate anxiety. If you need restorative care and feel nervous about your treatment, consider taking advantage of oral sedation or nitrous oxide to create a more relaxing experience. We are concerned not only about our patients' oral health but also about their emotional well-being while treatment is performed. Contact us to experience the highest level of dental care possible. Because we brush and floss our teeth every day, we may not always think about the significant impact of oral hygiene. Our teeth are composed of various parts, all of which are affected by various factors, oral hygiene being just one of many. The outermost part of a tooth is the enamel. This hard, shiny substance is the source of a beautiful smile, and serves to protect the inner areas of teeth. Enamel, though hard, is porous. Containing microscopic holes, this part of teeth can become worn by the acid in foods and beverages, or damaged by bacteria, in the form of cavities. Beneath the enamel lies the pulp chamber, which contains the nerves and vessels of a tooth. It may become necessary to visit your dentist for root canal therapy should this part of the tooth become infected. In our Tulsa dental practice, we make this procedure as comfortable and quick as possible. There are various reasons dental pulp may become infected. Most commonly, root canal therapy becomes necessary when a cavity has been left untreated for some time. At the heart of cavities, as well as subsequent infection, are bacteria. Our mouths are filled with hundreds of tiny microorganisms, some of which consume sugary substances left behind after meals and snacks. The waste secreted by the bacteria is acidic, eating away enamel and reaching the inner chambers of teeth. The progression of damage leads to infection and pain. Just as bacteria can damage teeth, they can also affect gum tissue. Some people find that the presence of gum disease leads to infection within a tooth. Gum tissue, meant to support stable teeth, may become diseased from bacterial activity. This affected tissue, which lies in close proximity to the roots of teeth, may pull away from tooth structure, allowing bacteria to move towards the root. In such an instance, the pulp of a tooth may become infected from the bottom up. Lastly, a tooth that has sustained a physical injury, such as during a sporting event, may not sustain adequate blood supply. Over time, the internal damage may result in the breakdown of pulp and subsequent infection. Most tooth injuries are quite minor, but we encourage our patients to have any dental injuries evaluated right away. 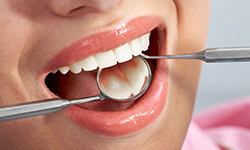 Root canal therapy is a beneficial treatment that most people wish to avoid. This procedure, performed carefully by Dr. Nauman at Glisten Dental, has long been associated with pain. Most commonly, however, patients report feeling more bored than anything else. In our dental practice, we handle patient care with great gentleness, using tools that speed up the process of removing infected tissue. Though root canal therapy is performed under local anesthesia, and patients feel nothing more than gentle pressure, we also offer sedation for those who are feeling anxious about their procedure. Your comfort is as important to us as the repair of damaged teeth. Your dentist in Tulsa can get you out of pain with gentle treatment. Contact us for your visit today.